On March 13, APA Legislative and Policy Committee member Jennifer Raitt testified before the U.S. House Appropriations Subcommittee on Transportation and Housing and Urban Development (T-HUD) and called upon Congress to reject the administration’s budget proposal and to boost funding for federal programs, such as CDBG, HOME, Choice Neighborhoods, BUILD (formerly TIGER), transit capital grants, and the range of surface transportation programs. Increasing funding to these key federal programs will continue to advance resiliency and expand opportunity in the nation’s communities. Improving the coordination of federal investments with local comprehrensive plans will heighten the impact of these efforts while avoiding waste, inefficiency, and compounding future losses from natural disasters. 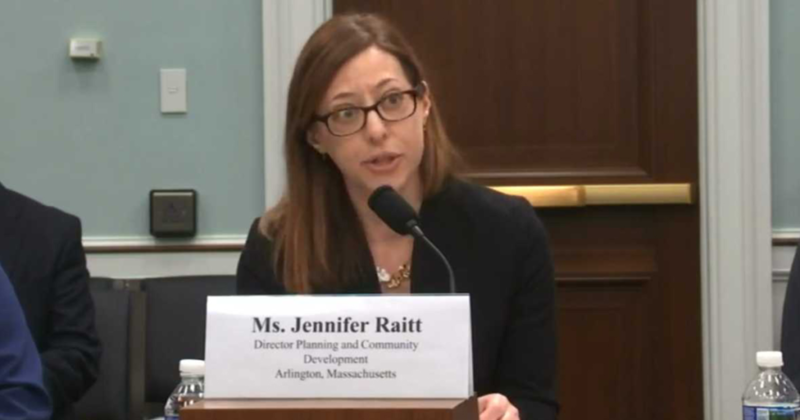 “APA and planners around the country are committed to creating just, healthy and prosperous communities that expand opportunity for all.” Jennifer Raitt. Raitt concluded her remarks stating that planners have a significant and direct role in planning for community resilience. While resiliency strategies and plans will be crafted and implemented locally, there is an essential partnership between local communities and the federal government. APA New Jersey was proud to support Ms. Raitt’s testimony and reinforced her points in a letter to Representative Bonnie Watson Coleman that can be found here.